This article is about a subject in an upcoming or recently released game. When the game is released, or more information about this subject is found, this article may need major rewriting. Remove this only when the changes have been applied. Joker (whose real name is given as Ren Amamiya in some media) is the protagonist of Persona 5, a PlayStation 3 and PlayStation 4 title from the Megami Tensei franchise's spin-off Persona series. In his game of origin, he is a Japanese high school student in his day life; however, he also has the power to access an alternate version of the world called the Metaverse. In said universe, he infiltrates the psyche of corrupted souls to steal their hearts, and he can summon Personas, powerful demon-like creatures. 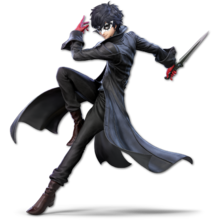 During The Game Awards on December 6, 2018, it was revealed that Joker would be appearing as a paid downloadable playable character in Super Smash Bros. Ultimate. He is the second DLC fighter (with Piranha Plant being the first), and the first one in the Fighters Pass, releasing as part of "Challenger Pack 1". He was released on April 17, 2019 (PST), and is classified as fighter #71. Aside from being able to wall jump, Joker has a special mechanic known as the "Rebellion Gauge", which is a meter that slowly fills up either over time, when taking damage or when Joker is behind his opponents in score/stocks, and fills up faster when he is attacked when using his down special, Rebel's Guard (as well as halving the damage taken). When this meter fills completely, Joker will summon the Persona Arsene, who assists him in battle by attacking in tandem with him, increasing the power and range of his standard moves. Joker's special moves are also enhanced, and his down special changes to Tetrakarn and Makarakarn. If Joker gets KO'd, the gauge will reset. The player can choose to play as six color variations of Joker's Phantom Thief outfit wearing his mask, as well as two versions of his Shujin Academy uniform wearing his glasses. His victory screen mimics the one from Persona 5, with the color of the screen changing to match the current colors of the stage Mementos if Joker were to win on that stage. If Joker wins the match with his Final Smash, the splash screen that appears at the end of the move will carry over to the victory screen. He is one of the lighter middleweight fighters, being heavier than the Ice Climbers, Lucario, Wolf, and Villager, but lighter than Ness, Lucas, Mii Brawler, and Inkling. Joker shares his English voice actor, Xander Mobus, with the game's announcer, as well as Master Hand and Crazy Hand. Joker is the second Super Smash Bros. fighter to not have his debut game on a Nintendo console at the time of their inclusion, with the first being Cloud Strife. With Final Fantasy VII being announced to release on the Nintendo Switch in 2019, Joker is the only confirmed Super Smash Bros. fighter to not have their debut game released or confirmed to release on a Nintendo system. Joker is the third Super Smash Bros. fighter to come from a predominantly M-rated series, after Solid Snake and Bayonetta. When Arsene is present in battle, Joker's render in-game and in the HUD will have his mask (or glasses in his alternate costume) removed. ↑ Super Smash Bros. Ultimate - Persona 5 Joker DLC Official Trailer | The Game Awards 2018 GameSpot. This page was last edited on April 18, 2019, at 21:37.